Due to the Memorial Day holiday, our usual fourth Monday meeting has been moved to the following evening, Tuesday, May 27th. Same time - 6:30pm, same location - Rapides Westside Library. We were going to meet this month at a location on the water to practice casting, but with a 70 percent forecast of thunderstorms, we'll meet at our usual location. On the agenda is the upcoming Grand Isle Fly Fishing Weekend, the CCA STAR Fly Fishing Division, and other upcoming events, as well as a discussion of saltwater fly fishing opportunities during the summer months. Our first-ever fly tying session will take place on Tuesday, May 20, at the Rapides Westside Library in Alexandria. Time is 6:30pm. Guests are invited. For this inaugural session, we'll have a special guest instructor - Kevin "Musicdoc" Andry. Kevin is a high school music instructor at St. Micheals in Baton Rouge. He's also an avid fly angler, kayak angler and fly tier, and maintains the "Kayak Fishing With Kevin" blog at kevinandry.wordpress.com. 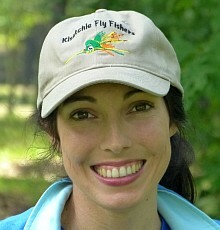 His site has been honored as one of the top kayak / fly fishing videos on the internet. For this beginning session, Kevin will cover some basic tools for the tier, then go into one of his favorite simple patterns demonstrating several tying techniques. He'll then demonstrate a more advanced pattern. For the simple pattern, members are encouraged to bring their tools and follow along. Materials will be provided. For those without tools, we have a few to borrow for this session (KFF is getting four sets of tools that should arrive for our June session). Come meet and greet Musicdoc... should be a great time!